Geneva/New York, 11 May 2001 — The international medical aid agency Médecins Sans Frontières (MSF) greets with skepticism today's announcement by UNAIDS of a "New Public/Private Sector Effort." The concept, described in an article in the Wall Street Journal today, of dramatically reducing prices of HIV/AIDS drugs by as much as 85 to 90 percent, is a good one. However, missing are concrete commitments from drug companies, national governments, and international donors. This agreement does nothing to stimulate countries' rights to produce or import inexpensive high-quality generic drugs, a key component to long-term, sustainable solutions for improving access to essential medicines. "The fact that a serious discussion has begun among drug companies on dramatically reducing the price of AIDS drugs is a victory, but a small one, much like an elephant giving birth to a mouse," said Bernard Pécoul, M.D., director of the MSF Access to Essential Medicines Campaign. "The reality is that despite this initiative, AIDS drugs will still be unaffordable for the vast majority of those in need in the poorest countries." The net effect of implementing this type of program could lead to a further consolidation of the AIDS drug market in the hands of a small number of multinational drug companies. It will likely discourage the growth of manufacturing capacity in developing countries. In contrast to the UNAIDS proposal, the Executive Order released by the Clinton White House yesterday recognized the need for flexibility in intellectual property rights law when it comes to combating the HIV/AIDS pandemic. While the Executive Order is a step in the right direction, MSF is concerned with its restriction to only HIV/AIDS drugs in "beneficiary" sub-Saharan African countries. This falls short of the statement made by President Clinton in Seattle on December 1, 1999, in which he broadly stated that the United States will, "henceforward implement its health care and trade policies in a manner that ensures that people in the poorest countries won't have to go without medicine they so desperately need." MSF encourages UNAIDS to explore more widespread use of generic competition. This is a proven sustainable solution. The example of Brazil is poignant. By the end of the year 2000, by using more cost-effective, locally produced generic drugs, Brazil will be able to offer combination anti-retroviral therapy to its citizens at approximately US$ 1,000 per year compared to a global price of $10,000 to $15,000. Political commitment plus high quality local production has already led to a dramatic increase in access to AIDS drugs in Brazil. In sharp contrast to this, an existing access initiative designed in close consultation with the drug industry and managed by UNAIDS has led to minimal price reductions. According to a leading AIDS treating physician in Kampala, Uganda, the prices of some drugs within the program can be purchased for lower prices in local pharmacies. The program has failed because companies never delivered on promised price reductions. The solution to the access crisis should not be driven by protecting commercial interests. 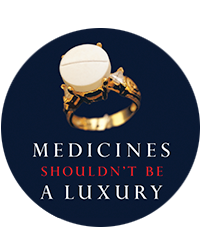 Leadership from national governments and participation from international agencies, the generic and proprietary industries, non-governmental organizations, and civil society is needed to implement a long-term, sustainable solution to ensure access to life-saving medicines in the developing world.